Poorly conceived website pages devoted to frequently asked questions can confuse and bore users while falling short of their SEO potential. If you plan or revise them well, FAQ pages can pay off for your company for branded and non-branded keywords. Are there too many questions on the page? Are the answers too brief? Does the content link to related pages? What is the tone? Is it playful, conversational, dry, entertaining, etc.? What are the calls to action in the answers as well as the design? Does the content reference customer-support downloads and communities? Does the content address a potential customer’s pain points and lead the person to a purchase? Is it easy to find the FAQ? Are appropriate images or video included? Make Up For Ever has a typically awful FAQ page. I got quite a workout finding the bottom of the 5,000-word page with no navigation. Make Up For Ever’s FAQ page ranks for some branded keywords. However, the single-page format prevents the company from ranking well for non-branded keywords like “makeup names,” which ranks 85 on Google and has 1,300 monthly searches. Its non-branded keywords sometimes miss the mark. This is a great opportunity for Buffer to dedicate resources to this and dig into the data more. If I worked at Buffer, I’d get excited about “link shortener” at No. 13 with 49,500 monthly searches. Are there any potential customers in that pool? 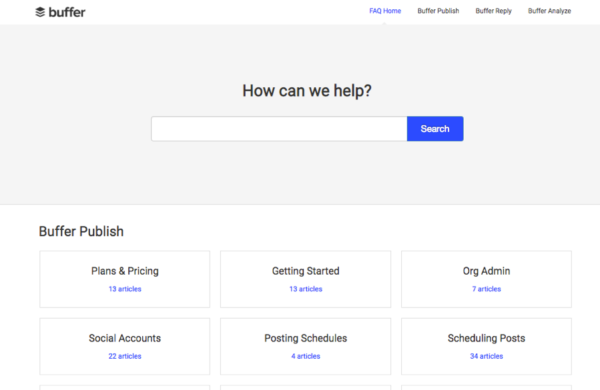 To improve its ranking for link shortening, Buffer could keep its FAQ content and content header and simply tweak the SEO page title – at least with the first SEO revision. Why make so many changes to the SEO page title? 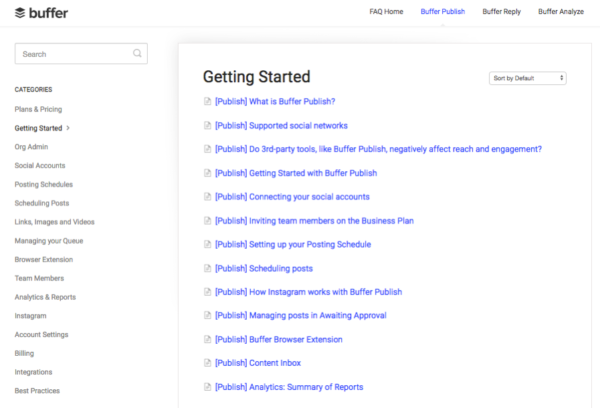 I would suggest removing “[Publish]” and “changing” and “Buffer FAQ”. I get the branding fascination. Sure, leave Buffer in the title if someone has a fit. (Hint: Google often dynamically adds a company name to search results anyway.) But I’d go bare bones to see how it performs. Let’s label this one: No-brainer. In the next revision, I’d make it “Custom Link Shortener” because that ranks No. 10 with 1,300 searches. For years, FAQ pages have been criticized as a waste of time. After all, wouldn’t a well-organized site already guide users to relevant information? FAQ pages have a pertinent role. FAQ content can pinpoint popular questions and provide convenient answers. An FAQ page should not be a last-minute thought or dumping ground. Don’t tuck it in a corner and throw in some brief answers about your hours, and shipping and return policies (useful but too limiting). Treat the FAQ as an asset even if it’s a mere blip in your overall site. You might be surprised to find out your current FAQ page ranks for some decent keyword phrases and accounts for a fair share of your natural search engine traffic. To learn whether that’s the case, start with a quick domain overview in SEMrush. It’s super easy. Drop in your website and get a strong sense of keywords people use and the pages they reach. Plus, SEMrush shows Google’s search volume. Use your website analytics to get other data, including pages that convert and the top organic landing pages. Where does your FAQ page fall among the top 100 pages? In other words, is it one of your top players? If not, that’s OK. You can solve that dilemma. Keep in mind that SEMrush tracks millions of keywords; it could miss some of yours. But it’s better than Google Analytics, which conceals natural search phrases. Some companies don’t list the FAQ in the navigation. They identify it as a help center. The terminology doesn’t matter – whatever works well for your users is better (serving visitors should always be the top priority over SEO). 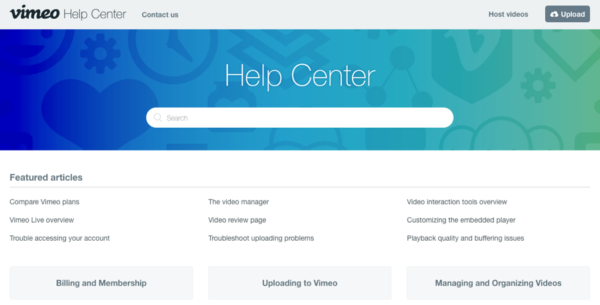 Vimeo does a good job of directing its visitors (featured articles use hover links). If you have an FAQ page, keep the URL. I prefer not to adjust a long-established page URL. Yes, 301 redirects work and can pass along an aging page’s authority. But start with your existing page even if it’s long like: www.awesomestuffwemakeandsell.com/frequently-asked-questions-support-for-customers. Many traditional FAQ pages expect users to wade through a series of questions to find one that may interest them. Not cool. Give users options, including links to topics and even a search box to find their way to the right answers. Search engines will eat up the new, original, useful content and deliver more rankings and website visitors. Improve existing pages with many of the same SEO options. You can revise anything, including the text. Sometimes adding a word or two can help the content header support one or more keyword phrases, including long tails. Create baseline ranking reports before you roll out the new or updated pages to measure your progress. Measure everything from organic visitor sessions and bounce rates to conversions. FAQs can be packed with designed user cues, including calls to actions and links to your other content. I also like FAQ designs where key information (e.g., a way to contact the company) is referenced on the side. 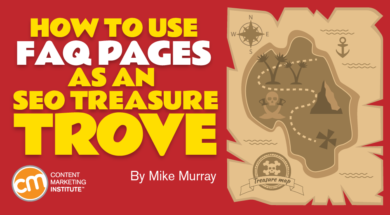 Don’t worry about introducing pages and being penalized for thin content. Google looks at your overall website and determines what’s useful and relevant. The strength of your overall website will protect you. When looking at SEO options, note that Google’s new structured data format called Q&A pages is not intended for FAQ pages (according to Google). Although it’s confusing, Google is formatting its Q&A snippet carousel for one question and multiple answers. It’s designed for forum and product support pages where multiple responses exist to one question. Ultimately, your FAQ page success depends on the thought you put into the number of pages, questions, answers, and the design. What approach works well for your company? Want your frequently asked content marketing questions answered? Subscribe to CMI’s free weekday newsletter.